Hello, everyone! 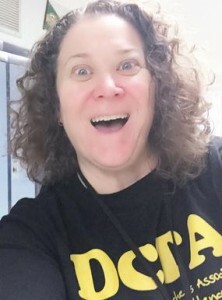 I am Amy Kalinchuk, career teacher and shenanigans artist. I am the lead teacher in the PLEX program at TJ. Since 1992, I have been teaching students to read and write, and I currently teach students with special needs about pragmatic language and executive functioning. I also enjoy helping with the positive behavior support program for the entire school–I give out the Snatraps awards once per month! In addition to teaching, I have a life of my own. ::collective gasp:: I am married and have a high school-aged daughter. I enjoy working out at a CrossFit™ gym, and in 2019 will be off my 1-year break from roller derby (we’ll see if my knees are in better shape by then). With my husband I run a small business, and keep busy spending time with my family, my dog and two cats, and our backyard chickens.